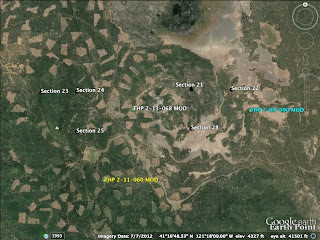 THPBlog: Sierra Pacific Industries to clearcut log NW of Bieber, CA. THP 2-13-068 MOD (Lost Egg THP) Sierra Pacific Industries, 327 acres; 99% clearcut, 1% roadside logging. Mosquito Lake, Armentrout Flat, Jimmerson Spring (MD: T40N R5E Sec.23, 24, 25; T40N R6E Sec.21, 22, 28). Winter operations, moderate erosion hazard, slopes up to 40%, wet meadows, herbicides, greater sandhill crane sightings, scattered large trees. Estimated public comment deadline: 11/14/13. This THP is about a dozen miles NW of Bieber, CA at an elevation of 4,000 to 5,200 feet. Sierra Pacific Industries is planning a tractor based clearcut logging operation in ponderosa pine, sugar pine and incense cedar forest. Some of the units are from the former 2007 Cessna and Gaspy THPs, which were deferred because of the 2012 Bagley Fire. The THP area is interspersed with seasonal meadows and drains into Egg Lake, a seasonal wetland. Long haired star tulip was found in a grassland area in unit 22C. Greater sandhill cranes and elk herds are known to frequent the area. More information is available on the THP Tracking Center website.